By the time you read this, my wife Shirley and I will be just past the half-way point of my one year sabbatical from the Utah Symphony. It has been a fascinating adventure to say the least, and thus far, the time has flown by in a blur. This mile marker also seems like a good place to pause and assess some of the impressions taken in from our time here, as well as a few lessons learned along the way. But for the sake of providing some context, I need to back up for a few moments. As a few of you know, part of what I wanted to explore for my sabbatical project was inspired by the ICSOM Governing Board working with the League of American Orchestras in addressing various diversity issues facing US orchestras. This is, of course, a wise long-term decision if American orchestras are to remain relevant in their individual communities, given our national demographic shifts. Salt Lake City, like many US cities, particularly western ones, has a large Latinx—predominantly Mexican-American—community, and orchestras in these cities face common issues in attempting to reach out to them. Mexicans aren’t fans of classical music and somehow must be educated about it. Mexicans will only be drawn to a symphony concert if the program includes only Mexican (or Spanish) music, or if there are several Latinx musicians playing onstage to whom they can relate, or if the program includes dancing (don’t laugh; I’ve heard this). It is with these memories and sensibilities that I decided to revisit Mexico, to re-connect with orchestras and former colleagues (both Mexican and American), to get to know some of the younger Mexican orchestra musicians coming up through the ranks, and to write a blog about this as my sabbatical project. It’s been my hope that folks would not only enjoy the articles, but also perhaps come to examine their own pre-conceived notions about this extraordinary country, its people, and their intense love for the arts. So, what are some of my impressions six months in to all this? The arts are ubiquitous here. In most Mexican cities, one can stand out in front of one’s residence and find examples of it without taking a single step: on the left, a sculpture; on the right, a monument; an artist painting on a canvas in the park across the way while a flamenco guitarist plays at the corner. And when standing in the colonial centers of so many Mexican towns, one can be bowled over simply by the old European architecture, the ornate designs on many of their homes’ portals and the intense splash of colors adorning the buildings. Vibrant colors seem to be everywhere else as well, from the clothing and textiles to the food, and even the music. Not only that, the arts aren’t considered elitist here the way they are increasingly perceived in the United States and even in much of Europe. In Mexico, the arts are considered basic to all human life and to the sustenance of the soul—as they should be. The Mexican orchestra industry is alive, well, and as vibrant as ever. For example, Mexico City houses approximately a dozen professional ensembles, if one counts the service bands with the orchestras. In the three decades since I left the music scene in this country, a few orchestras have shuttered their doors (like in Veracruz) but new ones have also arisen (like in Boca del Río, just down the road from Veracruz). And many of the ensembles are sounding better than ever with this new young generation of Mexican musicians assuming positions in their orchestras. Finally, we could learn a lesson in programming from our Mexican colleagues. Concertgoers in Mexico are accustomed to hearing their Revueltas and Moncayo woven in to programs along with their Ravel and Mahler, the same way that US audiences are used to hearing Bernstein and Copland in the mix with Beethoven and Strauss. For those orchestras looking to attract a local Latinx audience by programming more Mexican music, Mexican compositions need to find a way into their masterworks, educational, and pops series, not just a one time all-Mexican program. For, if it just consists of that one special show for the season, it will likely result in being perceived by the “target market” as simply pandering to them. So there you have it: random musings from our occasionally random wanderings around this unforgettable country. Our fascination with exploring Mexican culture, history, and cuisine has led us to briefly detour over to Spain and Portugal and explore Mexico’s European and Moorish roots. And as I have some friends and colleagues currently working in Spanish orchestras, we’re looking to hear them in concert in addition to getting their takes on being in the minority as foreigners in their adopted countries. And don’t worry: when we return to Mexico we still have musicians with whom to connect and more orchestras to check out. It should be fun, but by the time you read this, Shirley and I will likely be savoring tapas and sangria while listening to Rodrigo in Seville or Granada…or something. ¡Hasta luego! 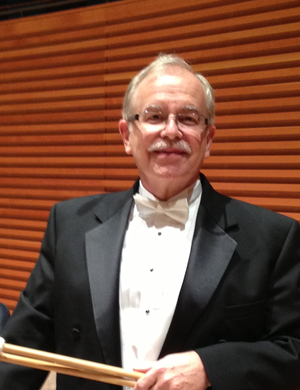 Note: The author is Principal Timpanist of the Utah Symphony and a former ICSOM President. His blog can be found on the web at www.nomadicdrummer.com and on Facebook.